Plano, Texas, home of Gaga’s urban garden is a microcosm of urban sprawl. One of Dallas largest suburbs, Plano is completely locked in by municipalities and can’t expand. There’s little undeveloped land remaining. This land originally was farm land all the way to the Red River which forms the border between Texas and Oklahoma. Where do you suppose all the beloved creatures that filled these lands went as we filled all the land they occupied with concrete? In the night a few weeks ago I heard a screech that was to say the least other worldly and raised such a commotion that I was spooked. The next morning in the snow we found tracks and compared it to what we believe are Bob-cat tracks. The tracks are close to the house and exit jumping on the roof of the greenhouse over the fence. The rabbit population a couple of years ago had actually gotten out of control but I have seen a reduction in the rabbit population lately. 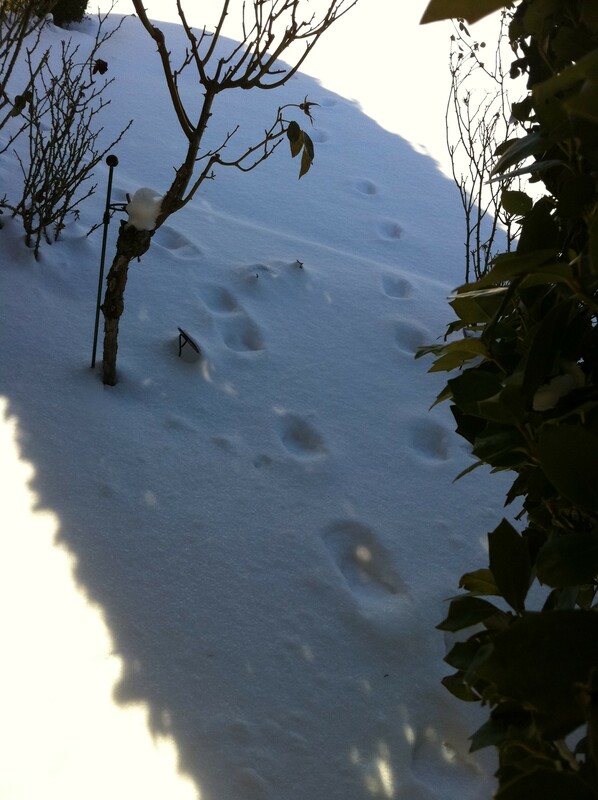 With the snow fresh I could see exactly where the Bob-cat jumped the fence and tracked around the yard. The cat stayed very close to the house and bushes where the rabbits and birds nest and then jumped the fence to exit back to the creek behind the house. 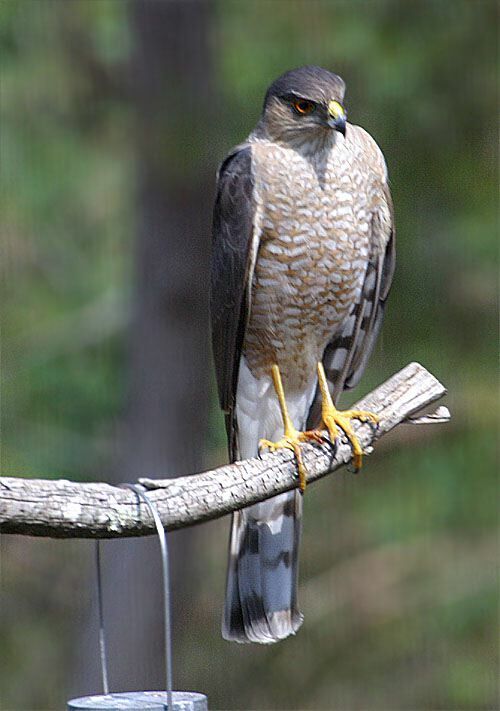 No sooner than I had read this article does a hawk start using my bird feeder as a “bird feeder”of his own to feed on my little birds. I am horrified, I am videotaping a beautiful hawk in the tree to show the kids when he actually eats one of my little birds at the bird feeder. I wrestle with whether I am upsetting the entire balance of nature with my bird feeder that by now is also feeding the squirrels. Also my pest control service has lectured me endlessly about attracting rodents. So the jury is still out on the bird feeders because I also had to spend $1500+ on a squirrel relocation program because they ate through the firewall around the fireplace and set up their own habit trail. I was home alone when they first made their presence known and I thought it was like a scene from the exorcist rather than squirrel inhabitants. I called our pest service who is also a friend in the middle of the night. I told him there was tapping in the walls and he assured me it was probably not a supernatural force. 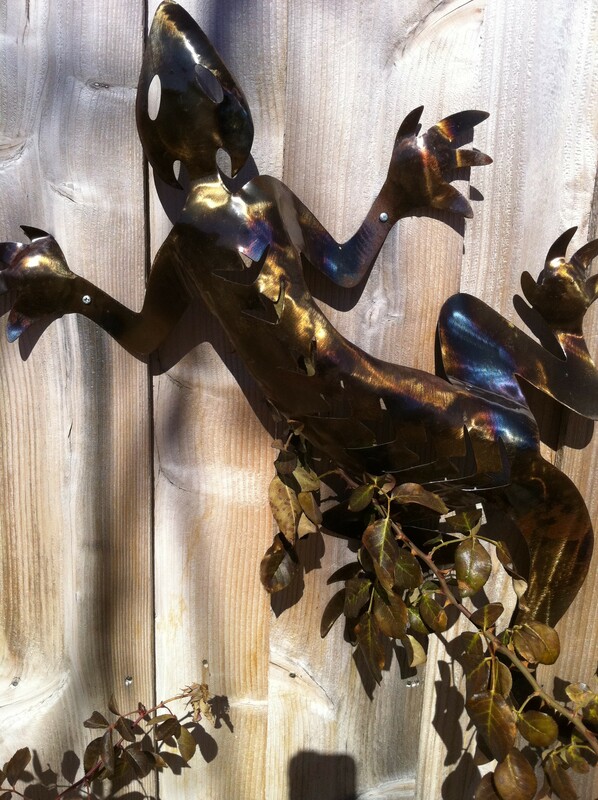 A few years back when a wild Texas storm with straight winds blew down the fence I looked out the kitchen window early in the morning to glowing eyes in the bird bath. 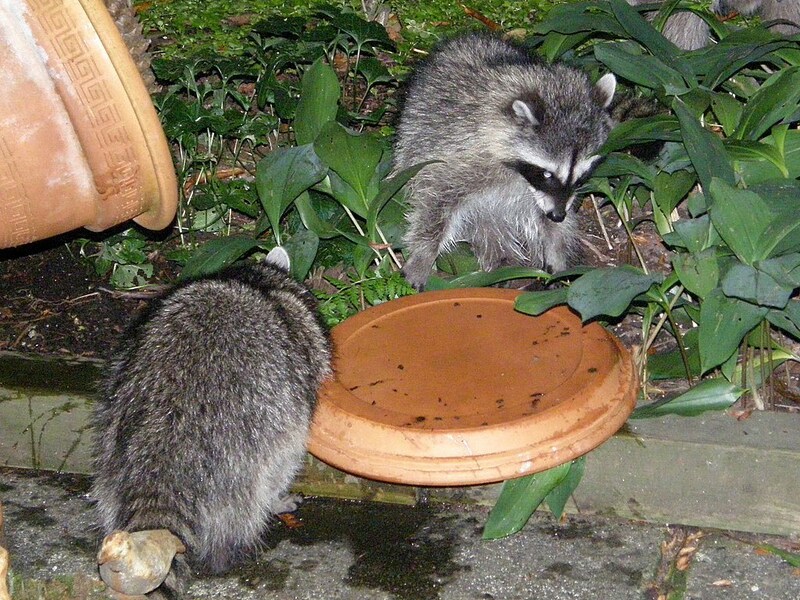 It was a mother raccoon and two babies bathing in the bird bath I had on the ground. I’ve seen box turtles and snakes and too many families of rabbits to mention. I count it a blessing to be surrounded by these creatures in an urban setting. All this adds up to a great responsibility. How wonderful to have an urban garden and to see and attract wild life everyday. 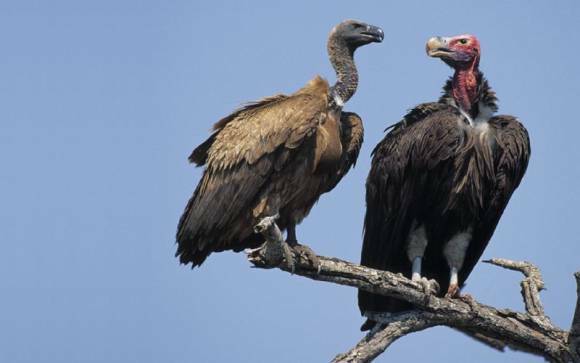 One day I came home for lunch only to see vultures poised on the brick mailbox. I will leave you with the hope that a garden is a respite for all of God’s creatures. If the suirrels would have stayed in the garden they would not have had to be put into the relocation program and I could have had a new counter-top instead. It’s in our hands folks. 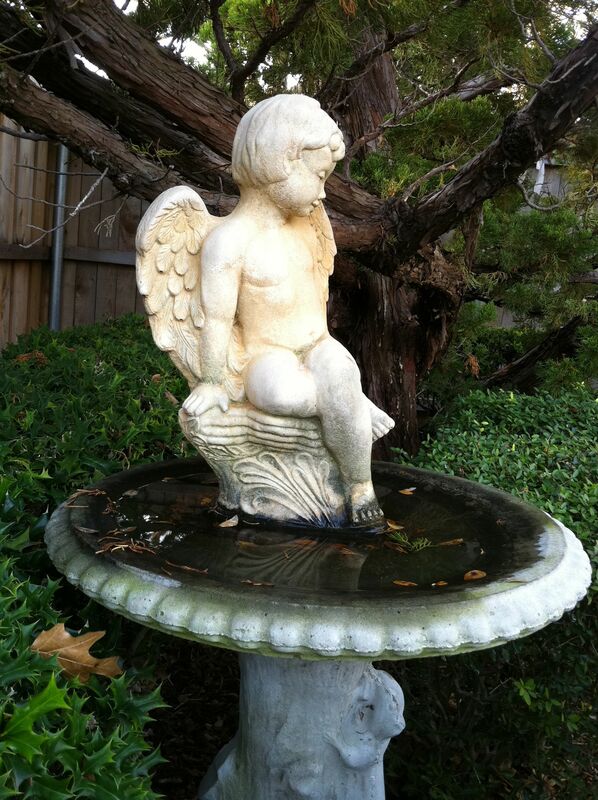 We have all kinds of creatures and we make a place for them in Gaga’s Garden. I may call you anonymous if that’s not too personal, may I? When I heard the bob cat in question make his first kill in the yard I thought I had heard a tiger attack, it was a terrifying sound. A creek also runs behind my son and daughter-in-law’s house and they had a bob-cat family with babies and they see them all the time right in town only 1 1/2 miles down the road. I just ask you where are these poor creatures supposed to live after we have taken up all the land they used to roam free? 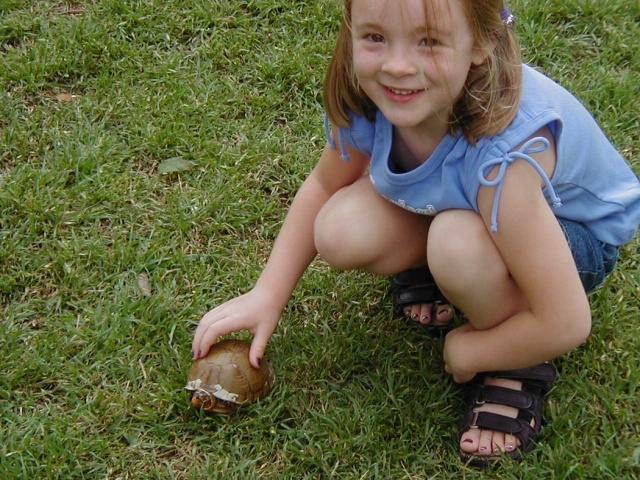 Suzy, all your wild critters in the big metro area are fascinating-lots more than I’ve see around our neighborhood. Now out on the farm is a different story! We do have plenty of skunks around, but have never had any to get into the back yard, except for their “aroma!” I hear reports of bobcats around. Hope you stayed warm during all this cold weather. 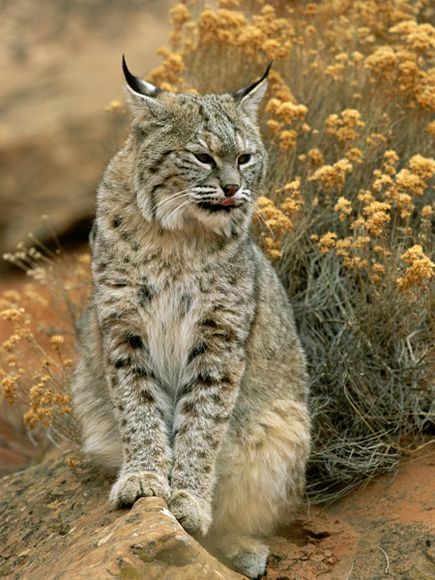 Bobcats are seen here in the urban sprawl of north central Alabama, as are foxes! I spied one about 5:30 one morning on the hill behind our house. Bout scared me to death! The bird feeder issue bothers me. I never realized we were setting them up for disaster. We have the same hawk problem here. My wife “stands guard” in the Spring with the wrens and cardinals have their young in nests on our place to keep the hawks away. It is usually an exercise in futility…. It’s been warm here this week. My roses are starting to put out!!! Will prune in early March, then WATCH OUT – Roses Galore!!!! I also read a strong counter point to that article. It seems when the author wrote the article it raised a very big stir as you can imagine in the urban bird feeder community. I just could not get over the irony of never having seen a hawk after my little birds UNTIL I read the article. By the way I sent you an email about inviting you to do a guest post. Thank-you so much for featuring my RT’s on your Paper Li. I am a big fan of yours – Mr. Redneck Rosarian!